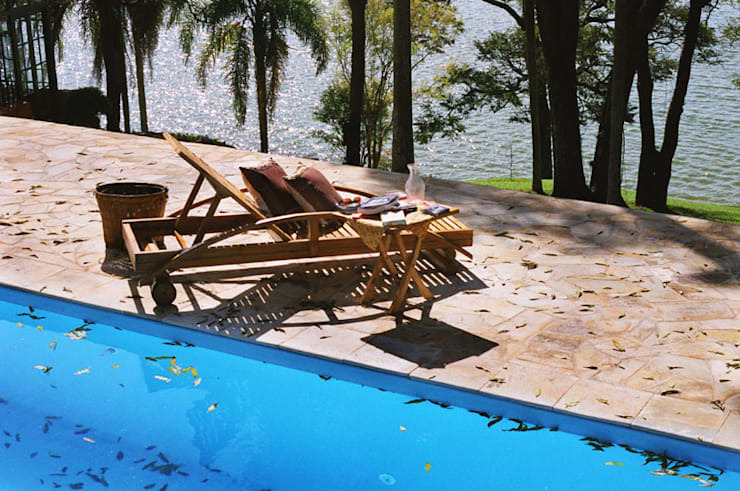 Who does not like a getaway to the countryside? Having a house in a field or in the mountains to spend weekends and forget about queues and everyday disasters is high on everyone's priority list. This ideabook is dedicated to all those who love to wake up to the birdsong, unrushed. It is a house which inspires rest and relaxation. Located on the outskirts of Sao Paulo, the Brazilian interior of this house is the concept of interior architects, Celia Orlandi By Ato em Art. We're sure you will be won over by this little gem, just as we were. Come join us for a tour of this fantastic home! Here is the cottage in question. Designed from the inside out, this is definitely a cottage made for comfortable living. On the one hand, it is surrounded by the water of a dam and on the other side shrubs. The building was clearly designed with the topography of the area in mind. 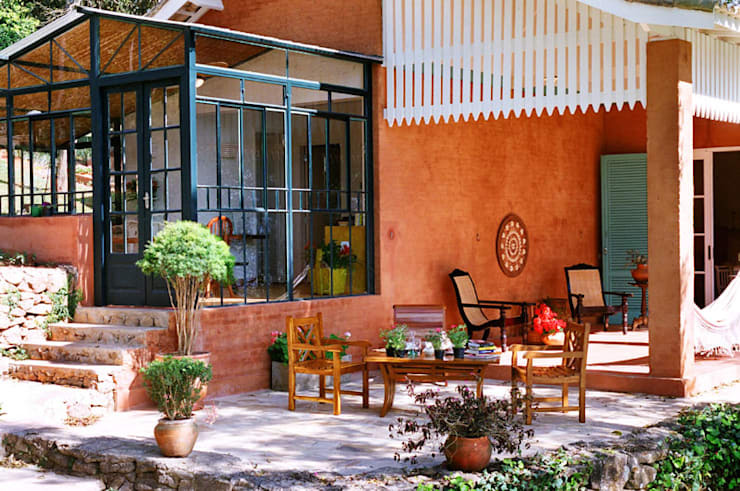 The eye-catching orange structure somehow also blends into the natural surroundings to create a tranquil balance. In this picture, we get to take a closer look at the colours used in this project. We can see aqua green, white and terracotta. The key materials are also prominent. This includes wood, brick, stone, metal and glass. The main entrance of the house consists of a glass box that opens to panoramic views and light. This is a great example of how you can use large amounts of glass very effectively without hindering the rusticstyle. 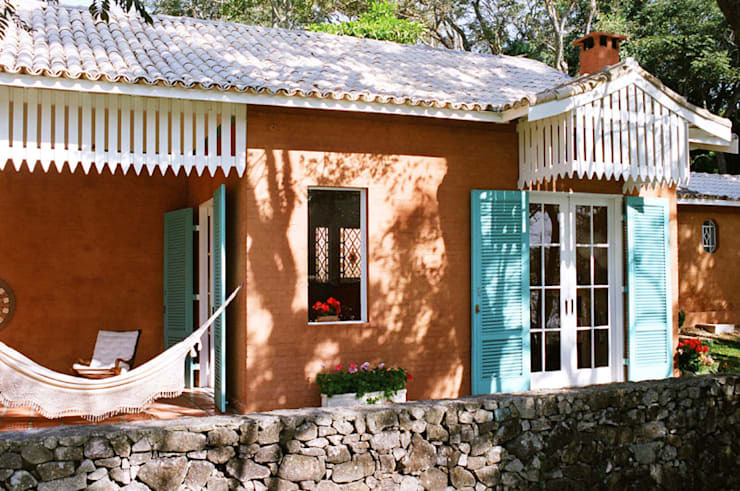 The facade looks like it could be a house in a fairy tale, while it also has touches of the tropical. The ambience created by the design and material used is superb. The stone wall, roof with clay shingles, doors which open up to the courtyard, and a hammock makes for an atmosphere of relaxation beyond compare. The dining room and kitchen are bathed in natural light through the glass enclosure, and divided into squares that frame the landscape whilst keeping it separate from the interior. 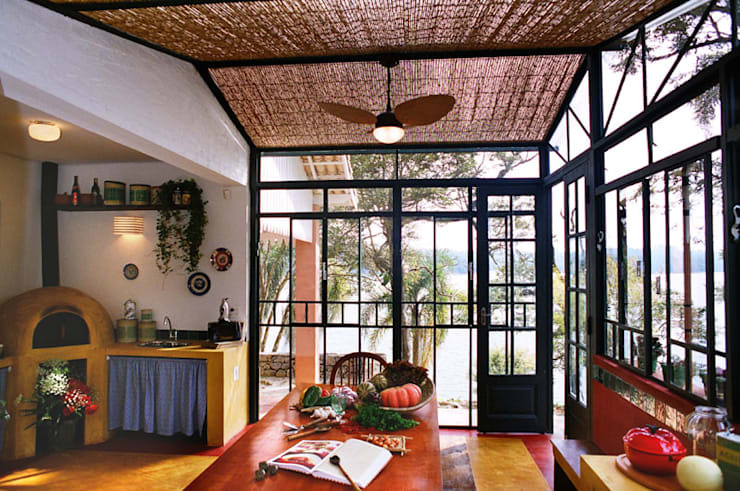 The bamboo cover is an economic and ecologically-friendly solution which optimizes thermal conditions. The rich red, purple and yellow colours we see in the flooring mimics vegetables, taking the space back to nature. The floor is not the only feature which is colourful. 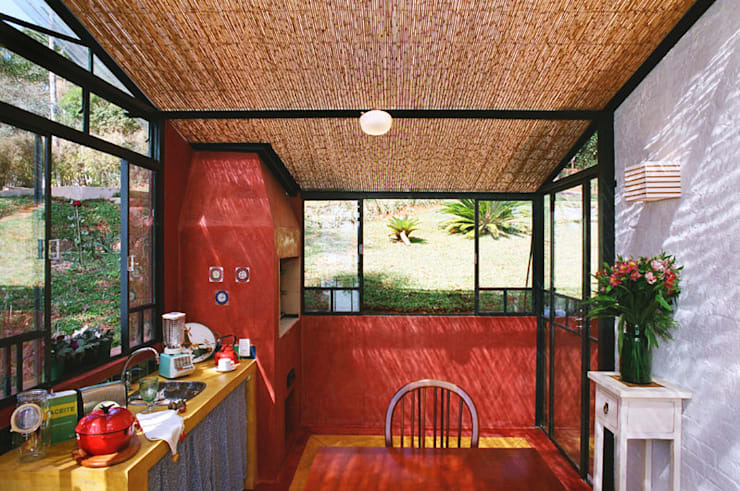 The stove, walls and ceiling vibrate with intense colours of warm red and mustard. The structure supporting the roof and the glass is made of black metal, not only contrasting to the bright colours, but also with the natural materials used otherwise. This brings in an eclectic element which is hard to ignore. Next, we turn to the living room—a cosy corner. This space is coated in neutral tones to expand the space and make the most of the natural light which floods the room. The fireplace is certainly a very welcome addition. Even if it is a false feature which is never actually utilised, a fireplace lends an unmistakable visual warmth to any room. This living room’s warm and inviting look is completed by the addition of comforting textiles and vintage furniture. Who wouldn’t want a feature like this in their home? In this corner of the house, we can see the addition of a marvellous reading corner. 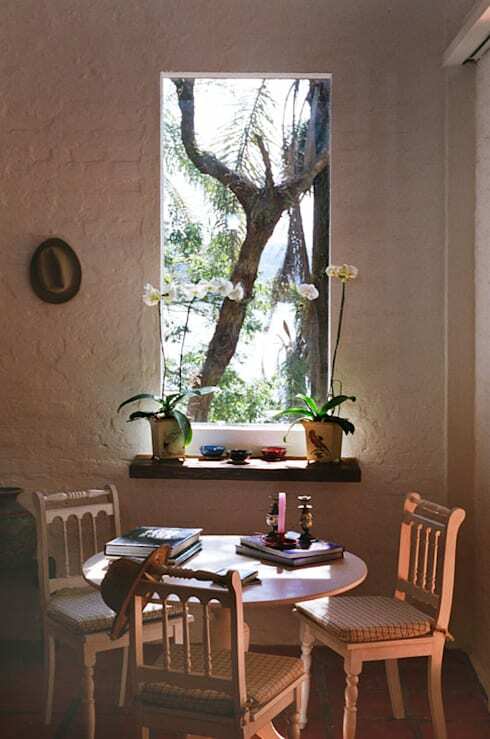 A round table has been placed next to a (previously non-existent) window that frames the landscape of palms and water, to inspire and distract inhabitants while they are doing homework or catching up on the daily news. In this bedroom we find an interior which is hard to reject for its beauty. 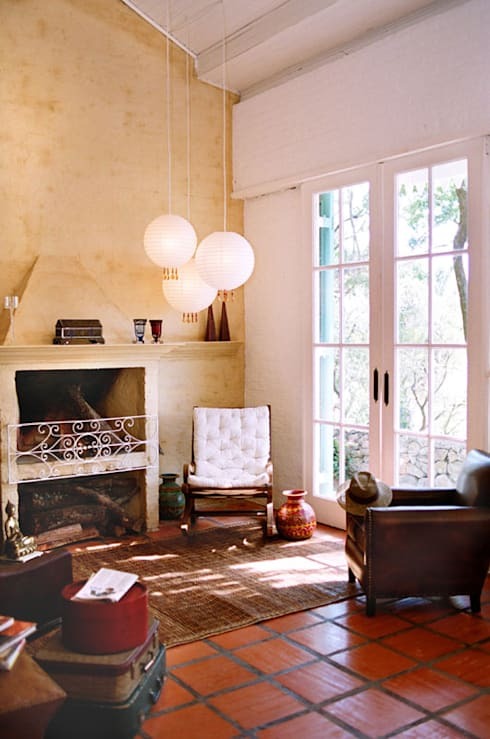 Stone tiles on the floor and exposed brick walls produce a combination which is undeniably beautiful and relaxing. The interior design was based on creating an environment which is full and serene. 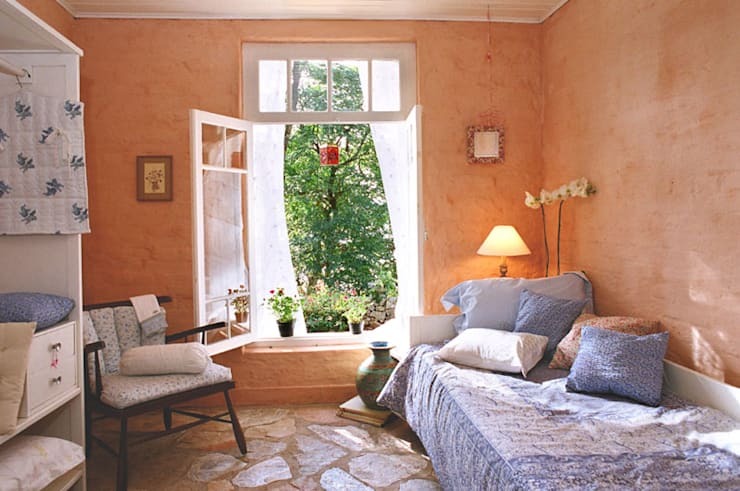 Both bathrooms and bedrooms are harmonious and romantic. How did the designers achieve this? It is evident that this was mainly achieved by the use of pastels and neutral colours such as melon and lilac, as well as decorative objects which is also inspirational. Let's go back yard before we head off from this wonderful project. 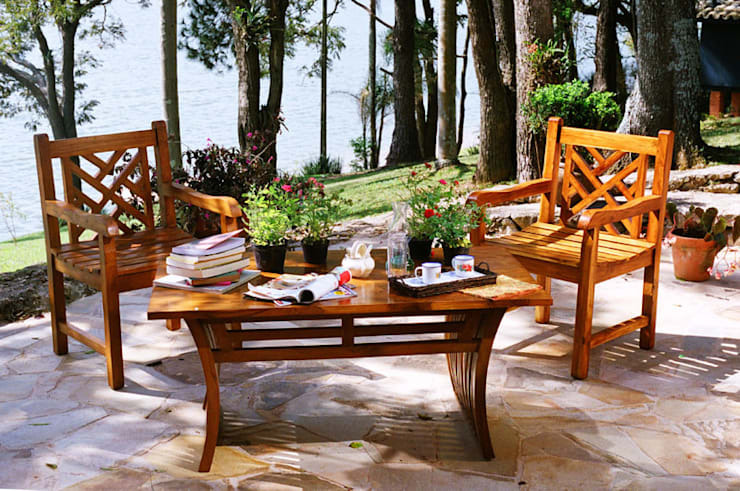 Here we can see an arrangement without arrogance, consisting of a simple table and two wooden chairs that create the perfect place to spend an afternoon. You’ll need nothing more than the surrounding nature to have a great time. Lastly, we’ve decided to make everyone a little envious by showcasing the swimming pool of this house. We told you that this is the cottage everyone wants. Now, after seeing everything the property has to offer, wouldn’t you agree? Now, if you want more cottage inspiration, head on over to take a look at this: Beautiful, cosy and stylish option! 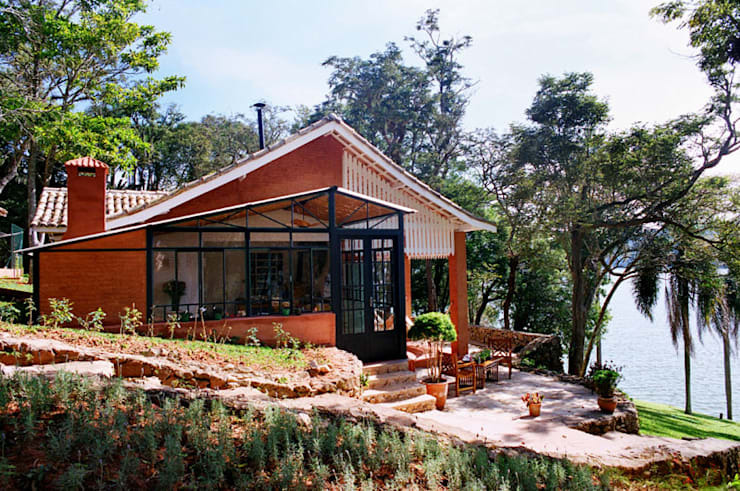 What did you think of this surprising little home?